Box Text: With every wish comes true desire. Where worlds collide, a select few are trained to handle any situation. But when mythical treasures appear and personal demons rear their ugly heads, nothing is as simple as it seems. Danger awaits around every corner. Knowledge becomes power, and only the truth will set you free. Practice alchemy to improve your skills and discover new items to create. The Active Cost Card Battle System shows you the exact order of battle, bringing more strategy to every fight. See enemies on the map. Avoid, destroy, or battle your enemies. With symbol encounters, you decide how to roam. Accept missions from the Guild to improve your rating as a person and with the Guild. 05-24-2018 noxie Box Text With every wish comes true desire. Where worlds collide, a select few are trained to handle any situation. But when mythical treasures appear and personal demons rear their ugly heads, nothing is as simple as it seems. Danger awaits around every corner. Knowledge becomes power, and only the truth will set you free. •All-New Alchemy Level System Practice alchemy to improve your skills and discover new items to create. 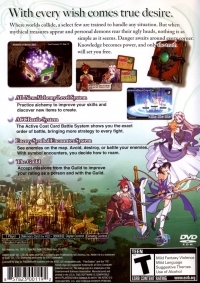 •ACC Battle System The Active Cost Card Battle System shows you the exact order of battle, bringing more strategy to every fight. •Enemy Symbol Encounter System See enemies on the map. Avoid, destroy, or battle your enemies. With symbol encounters, you decide how to roam. •The Guild Accept missions from the Guild to improve your rating as a person and with the Guild. 08-26-2011 climhazard Box Text With every wish comes true desire. Where worlds collide, a select few are trained to handle any situation. But when mythical treasures appear and personal demons rear their ugly heads, nothing is as simple as it seems. Danger awaits around every corner. Knowledge becomes power, and only the truth will set you free. 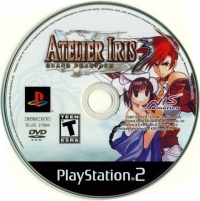 This is a list of VGCollect users who have Atelier Iris 3: Grand Phantasm in their Collection. This is a list of VGCollect users who have Atelier Iris 3: Grand Phantasm in their Sell List. 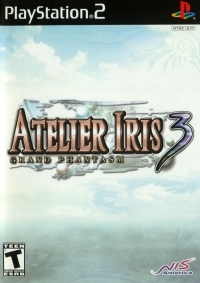 This is a list of VGCollect users who have Atelier Iris 3: Grand Phantasm in their Wish List.